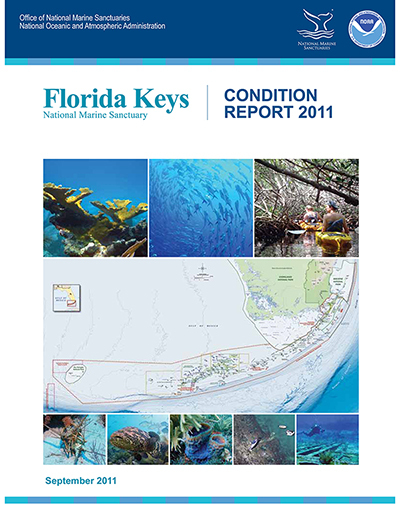 This comprehensive report examines the status of Florida Keys National Marine Sanctuary’s water quality, habitats, marine life and cultural resources. It also outlines the various threats to resource health, and highlights management actions taken to address those pressures. The status of sanctuary resources are rated on a scale from "good" to "poor," and are assigned a trend based on scientifically observed changes over time. The current conditions of the sanctuary are the result of more than a century of pressures, including a history of discharges, coastal development, habitat loss, and over exploitation of large fish and keystone species. The condition of the sanctuary is also influenced by factors which occur outside its boundaries, such as regional impacts to water quality and global climate change. Since its designation in 1990, Florida Keys National Marine Sanctuary has worked to address human influences to resource health. Sanctuary management actions, including the prohibition of pollution discharges and the designation of highly protected zones, have helped improve water quality, increase the size and abundance of certain fish species and spiny lobster in the sanctuary’s Ecological Reserves, and document the return of some historic fish spawning aggregations. Human actions — such as poaching, vessel groundings and discharging of marine debris — continue to negatively affect the habitat and living resources of the sanctuary, but they may be improved with long term management efforts, regulatory compliance and community involvement. This Condition Report, the first of its kind for Florida Keys National Marine Sanctuary, provides an important baseline on the status of sanctuary resources and will guide the comprehensive review of sanctuary regulations and its management plan.